Every Easter and Christmas, my mom topped her ham with a Pineapple Brown Sugar Ham Glaze. I can’t imagine eating holiday ham any other way! After baking ham for years, I’m going to share a few tips for the perfect holiday baked ham. The holidays would not be the same without my Mom’s ham and Pineapple Brown Sugar Ham Glaze. Every Thanksgiving we had roasted turkey, and every Christmas Mom served ham. I love the sweet and slightly sticky glaze and the way it compliments the flavor of the ham. This glaze is easy to put together, it requires a pan, whisk and about 5 minutes. Your 8 year old can whisk this together for you while you watch! Ham is best served with a baked on glaze. Oh, and about the glaze packet inside of the package of ham? Toss that directly into the garbage, and gather the ingredients for Pineapple Brown Sugar Ham Glaze. In a few minutes, you’ll have the best and most simple glaze ready to pour on your ham! Mom used to place pineapple rings on the ham using toothpicks to secure the pineapple, I skip that step, but if you like pineapple pinned to your ham, pin away! -I like to purchase bone-in ham for baking. Back in the day, my mom always bought a ham shaped like a large egg. A ham with a bone-in insures your ham is a real ham, not a pressed together piece of pig and pig “parts”. I often purchase my ham at Costco or my local grocery store. Bone in hams have the best flavor! -Let the ham sit on the counter for at least an hour before baking. I like to take it out 1 1/2 hours ahead of baking time. This is an important step! 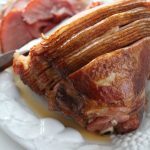 If you take the ham directly from the fridge to oven, it will need an additional hour in the oven to heat completely, which tends to lead to a drier ham. I cannot stress this tip enough. -Turn oven on for at least 30 minutes before placing ham in oven. The oven will stay hot even after opening the door. I like to think of the oven this way- The longer it is preheated, the hotter the oven gets and stays. A good thing if you are roasting meat. -Bake the ham for an hour without glaze, covered, then glaze and remove the foil covering so the glaze has a chance to caramelize just a bit! -Use the heaviest pan you have, or if you’re using a disposable aluminum pan, place a jelly roll pan or cookie sheet underneath to insure your ham doesn’t get scorched on the bottom. Take ham out of refrigerator, completely unwrap packaging and discard. If there is a piece of plastic over the end of the bone (bone guard), discard. Let ham sit on counter for 1-1 1/2 hours in a heavy baking pan before baking. Thirty minutes before baking, place rack on lower 1/3 of oven and turn oven to 300 degrees. When ready to bake, place 1/2 cup water in bottom of pan, cover ham with foil and seal edges of foil to pan. Bake for 10-12 minutes per pound. Gather glaze ingredients while ham is baking, whisk together in a pan and cook over low heat until sugar is dissolved or the glaze is bubbly (about 3-5 minutes). Set aside until ready to pour onto ham. When ham is heated, remove ham from oven and turn heat to 400 degrees. Remove foil from ham and discard any liquid left in pan by spooning out or using a bulb baster. Spoon glaze over ham and return to oven for 10-15 minutes or just until glaze is bubbling a bit. -Important to remember the ham is already cooked, you are simply warming the ham and glazing before serving! -The use of mustard and cinnamon in the glaze are optional. I always use the mustard, but hardly ever add the cinnamon. Do you usually buy a spiral cut ham? Also, do you have a favorite brand? I often purchase a spiral cut ham. We like the Costco brand, it is a good quality ham, and with a good glaze is really tasty! If you have the budget, I highly recommend the Snake River brand Hams. They are the best I have ever tasted! Shipped frozen, they need to thaw a couple of days before cooking. Happy holidays! Can’t wait to make this for Easter. Your glaze sounds delicious! I’m excited to try this out. I think this might be my first ham? Usually someone else makes it 😉 I wanted to try a slow cooker, but my ham is too tall. This sounds great! Thanks for the extra tips. I wouldn’t have thought to let it sit out first. How did your ham turn out? I hope your Easter was delicious and enjoyable! I hope my tips helped. I was thinking ahead to Easter today and thought “I wonder if Si has instructions for ham” because I always seem to cook a dry ham. I read through your instructions and I think I’ve got it figured out now, thanks to you! I’ll come back after and let you know how it turned out!